Product prices and availability are accurate as of 2019-04-19 00:41:17 UTC and are subject to change. Any price and availability information displayed on http://www.amazon.com/ at the time of purchase will apply to the purchase of this product. Reverse osmosis (RO) systems today are bulky, difficult to install, and many require electricity and pumps to operate. Most importantly, conventional RO systems are extremely inefficient, wasting up to 24 gallons of water for every gallon of drinkable water! Brondell's Circle Reverse Osmosis Water Filtration System utilizes patented new technology to eliminate back-pressure, making it up to 10 times more efficient than current conventional RO systems. Additionally, the Circle RO Water Filter eliminates any need for electricity by integrating the tank and filters. Brondell's Circle is an all-in-one, easy-to-install complete system. 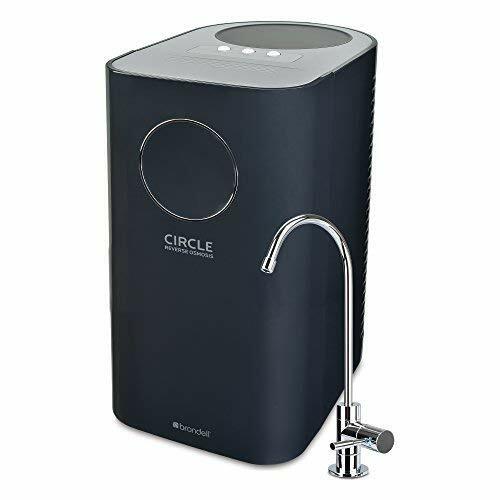 The Brondell H2O+ Circle RO Water Filter’s exclusive Smart Valve and unique circular reservoir design are the keys to its efficient design. This special technology eliminates back-pressure on the RO membrane filter, making the Circle RO Water Filter a leader in RO efficiency. The Circle RO Water Filter reduces wastewater to an average of 2.1 gallons for every gallon of drinking water – up to 10 times more efficient than many conventional RO systems currently being sold (and in some cases, even over 10 times as efficient). In addition, the Circle RO Water Filter’s refill rate is more than twice as fast as non-electric systems, and equally as fast as those with electric pumps. We’ve also simplified installation and maintenance with features such as auto-flushing, twist-and-seal filter changes, and “quick-connect” connections. The Brondell H2O+ Circle RO Water Filter delivers water savings, power savings, and space-savings - all in a beautiful, simplified design. 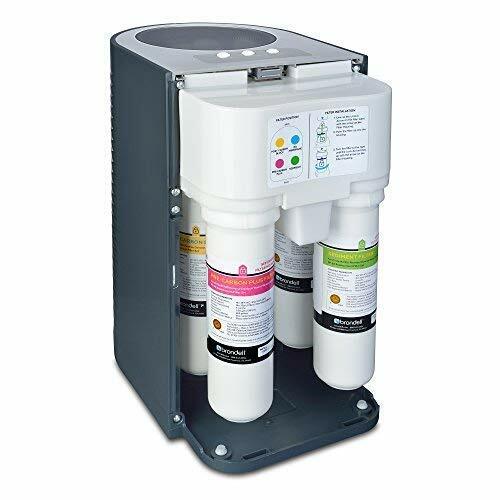 The Circle Reverse Osmosis Water Filtration System utilizes four separate advanced water filters, dramatically reducing industrial chemicals, heavy metals, pesticides, herbicides, total dissolved solids (TDS), volatile organic compounds (VOCs), microorganisms, and bad tastes and odors. Reduce harmful chemicals like fluoride; atrazine; hexavalent & trivalent chromium; chlorobenzene; trihalomethanes; methoxychlor; endrin; 2,4-D; benzine; DBCP; pentavalent arsenic; barium; radium; cadmium; lead; and aesthetic chlorine from your tap water for a healthy home and family. The Circle RO Water Filter easily installs under your kitchen counter, and everything needed for installation is included. This is the fastest, easiest, most elegant, and most efficient high-quality reverse osmosis system available.